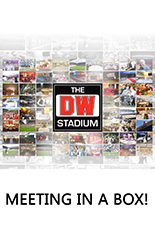 The DW Stadium, home of Wigan Athletic and Wigan Warriors, has 12 fantastic suites. It is a unique venue for corporate events and business meetings, as well as parties, weddings and other celebration events. 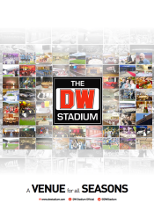 You will always find the welcome at the DW Stadium a warm one; the facilities and surroundings we offer will impress your guests and leave you feeling relaxed in the knowledge that your time spent with us will be memorable. Couple its facilities with our team of award winning in-house team of chefs and you are sure to have an event that is stylishly and memorably catered for; and remembered for all the right reasons. Facilities range from an Executive Box for up to 20 people to the rather unique indoor Marquee for up to 500 people. Eight suites offer spectacular pitch views. 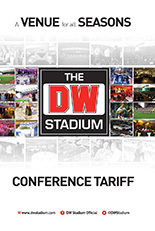 Two suites offer ground floor access, ideal for car launches and exhibitions. All suites offer air-conditioning and complimentary Wi-fi. Externally, there are numerous car parks available which we use not only for parking vehicles but also for outside exhibitions, car clinics, team building, etc.